Readers at RTDM would be aware of my ceaseless quest to understand the Hindi heartland, its society, its politics and its people through the study of subaltern visual/audio art as found in the caves of Youtube. History is written by the conquerers, editorials are written by those who can pay for them—it is only in the non corporate embodiments of popular culture that the truth of its times lie. And may I also say a lot of its beauty. (to the tune of “Saare jahaan se accha” )Namaskar, aaj tak main aap ka swagat hain. Bihar main chal rahe teen din se devaron ke hartal aaj samapt hui. Mukhe mantri shreemati Rabri Devi unke maangein sweekar karte huye Bihar ke tamam bahujaiyon ko phagan bhar ke liye free karne ki ghoshna ki hain. Devar jab chahe, jahaan chahe, jaise chahen apne bhoujaiyon pe rang dal saakte hain. And this concludes, for today at least, our journey of discovery through the living breathing history as captured in these videos on Youtube. Except there is a Swapan Saha in Bihar also. You mean like aamir khan and ajay devgan ;-)? great piece of investigative journalism…more more! awesome! Beats ‘Beder Meye Jyoshna’ , ‘Baba keno Chakor’ hands down!! These days the posters of Bhojpuri films give the others (except Hindi) a run for their money in Kolkata. More than the videos it your writings…….God made GreatBong ! 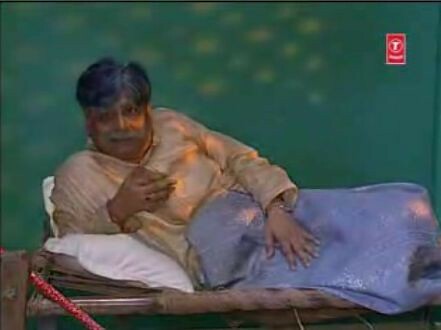 From “Baba keno Chakor” to “Minister Fatakeshto” …. Swapan Saha has proved himself to be a great value for money director. His financial intellect is excellent. Maybe the only Swapan Saha in Bihar is Lalu — who is considered to have done wonders to the Railway’s balance sheet. Great job Arnab with the other videos – I’m amazed at the gems you dug up! And you know, I say this without a hint of sarcasm – Hindi film and serial makers should see these videos to figure out why exactly they’ve fallen off the map as far as UP and Bihar are concerned. Oh and the Bongs have managed to sneak into Bhojpuri turf as well. The biggest female superstar in Bhojpuri films (don’t believe the Naghma hype) is Rani Chatterjee! It’s only much later that he started acting in Bhojpuri films and is arguably a much bigger star than Ravi Kissen in Bhojpuri. 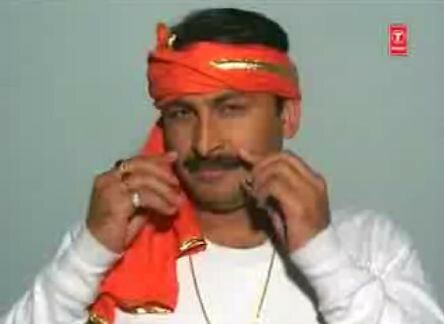 Don’t miss the mustache subtext in the first video – Manoj Tiwari seems to emphasise subtly the fact that he has the mush and his enemy only has red goggles. Even the red goggles, he takes away at the end briefly before handing them back. How abt reviewing a bhojpuri blockbuster for us, Arnab-da ?? I always learn rom you. Your videos led me to ‘Duty double sasuraar mein’ satisfying my own great quest for understanding sexuality. Bless you dear Arnab, bless you. Sadly not everything can be incorporated in real life. I am just a spectator who is in awe of such lucid poetry. its quite informative about the female tailoring world; it seems some ladies have a specially close relationship with their tailors……..
Hey awesome blog :)All articles were interesting !! All started by Great bong.